Step out of the city life by going to Nature & Wildlife Tours and Hymettus. Appreciate the collections at Acropolis Museum and Athens Art Gallery. Step out of Athens to go to Spata and see Attica Zoological Park, which is approximately 32 minutes away. The adventure continues: steep yourself in history at Acropolis of Athens, view the masterpieces at Pandora Art Gallery, shop like a local with Underflow Record Store & Art Gallery, and admire the masterpieces at Frissiras Museum. To find traveler tips, reviews, photos, and more tourist information, read Athens day trip site . If you are flying in from Portugal, the closest major airport is Eleftherios Venizelos International Airport. 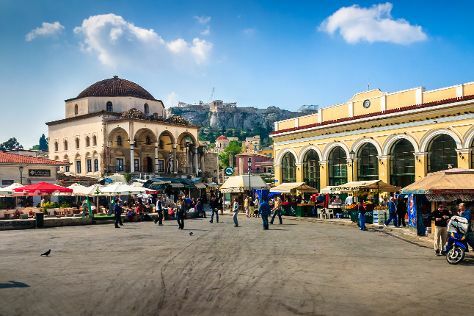 In April in Athens, expect temperatures between 24°C during the day and 15°C at night. Wrap up your sightseeing on the 12th (Fri) to allow time to travel back home.